Edward S. Alexander is a 2009 graduate of the University of Illinois with a Bachelor of Arts in History. He has worked since 2011 at Pamplin Historical Park & The National Museum of the Civil War Soldier in Petersburg, Virginia, and previously with Fredericksburg and Spotsylvania National Military Park and the Illinois Department of Natural Resources. 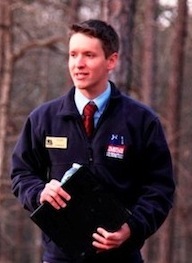 A current resident of Richmond, Virginia, Edward’s research is focused on the Sixth Corps of the Army of the Potomac.